There are hiking trails in Wisconsin Dells, and many trails a short drive away. If you use the Dells as a base camp for your vacation, you can get away into the wilderness on many hiking paths at state natural areas and parks that orbit the resort and water park capital of the world. This is true slackpacking: trouncing through the great outdoors by day and relaxing poolside at a resort in the evening. The Dells of The Wisconsin River State Natural Area includes a lesser known hiking trail that is minutes away from downtown Wisconsin Dells. The trail is an easy and wide two track that makes a loop. It begins in a densely wooded area and leads to a hidden beach along the Wisconsin River where you can get a view into The Narrows. 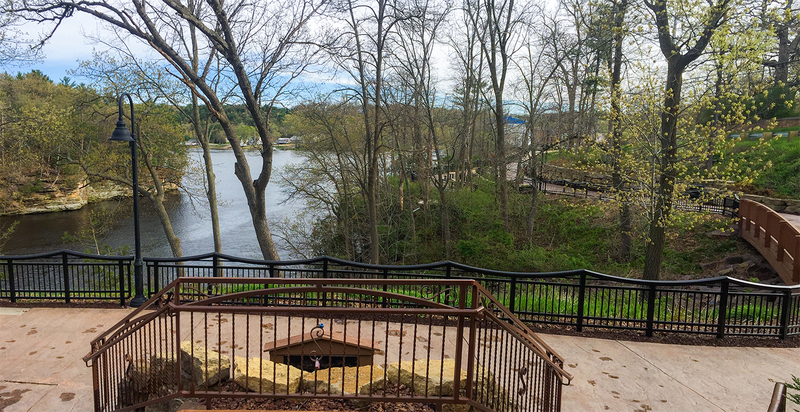 The Wisconsin Dells Riverwalk is paved, and wide. It can accommodate bicycles side by side with walkers and joggers. The trail is ADA accessible. It leads to several scenic overlooks and includes historical monuments that tell the story of Wisconsin Dells over 10 chapters. Stop by the Riverwalk Pub for a beer and burger on the outdoor patio overlooking the River and Riverwalk. The Echo Rock hiking trail at Mirror Lake State Park is the best hiking trail in Wisconsin Dells for families with young children. The trail is very easy and paved for most of its length. But, the sights are no less exhilarating than a more difficult hike. This incredible hidden gorge and waterfall is a spectacular sight. Most of the trail into the gorge is very easy and suitable for any age group or athletic ability. Near the end of the trail, the scene changes. Since a boardwalk washed away in a flood you will now have to walk through a stream and climb over boulders to reach the waterfall. This is a one-of-a-kind diversion for young agile adventurers. Prepare for wet feet. This isn't really a hike, just a short walk to one of the most awesome hidden gorges in America. It is extremely difficult to get a view of the gorge without swimming or climbing on precarious ledges. Most people who come here will be sorely disappointed that there are no vantage points or official trails that provide even a view of the gorge - much less a way in. The only way in is to 'swim' or wade in. You will feel transported out of Wisconsin on this unusual trail at Baxter Hollow. Seasoned backcountry hikers with trekking poles will make quick work of this 4.6-mile out-and-back. But, regular Wisconsin walkers will be stumbling all the way along this rocky trail which might better be described as a shallow stream bed. The Merrimac Segment is a 3.6-mile easy footpath in the Baraboo Hills area. As a section of the Ice Age National Scenic Trail, it connects with the Devil's Lake Segment at the northwest. On the southeast end, there are a few miles of quiet country and city roads to hike between the trailhead and the Merrimac Ferry which shuttles hikers across Lake Wisconsin fee-free; the trailhead for the Gibraltar segment is at the south ferry terminal. This segment of the Ice Age National Scenic Trail connects Parfrey's Glen with Devils Lake State Park. It includes a level 4 mountaineering rated climb, a two-mile long ascent of 775 feet. The trail meanders through shaded hardwood forests on a single track footpath. This is a favorite of trail runners in the area. Quincy Bluff and Wetlands State Natural Area is a sprawling wildlife area including two hiking trails. The Lone Rock trail is long and traverses through more wild areas of the preserve. You might see a wolf or a bobcat if you are lucky. You can also try scrambling to the top of picturesque Lone Rock. The other hiking trail in Quincy Bluff State Natural Area is an easy two-track trail that is excellent for families and not too long. You'll get a taste of the wild side without getting too far into the wilderness. This would be an excellent place for a rustic picnic beneath the trees. Cross Lake Wisconsin via the Merrimac Ferry. On the south side of the crossing, you can park at the Ferry landing and head out on the extremely beautiful Gibraltar Rock Segment of the Ice Age National Scenic Trail. Or, you can drive a few miles down the highway and take a short walk to the top of Gibraltar Rock State Natural Area - the highest point in Columbia County. This is a fantastic can't miss trail experience in the Wisconsin Dells area. This is a short walk up an established trail and stairs to a high bald rock overlooking the Wisconsin River. This amazing place is a treat for people of all fitness levels. This place should be a must-do on everyone's summer bucket list. A monumental sandstone arch and Paleoindian dwelling site are the star features of this easy 1.5-mile loop. The natural rock bridge found here is the largest in Wisconsin and comparable to the famous arches found in Utah. You can continue walking for up to 6 miles through woodlands and prairie. The Kickapoo Valley Reserve is a bit of a drive from Wisconsin Dells, but it is a beautiful scenic drive through Wisconsin's Driftless Area. The hiking trail is worth it on all accounts and in all seasons. It's a beautiful mountain-like escape into a deep 400-year-old white pine forest and includes a level 5 mountaineering rated climb to an overlook where eagles soar. Around the corner from Mt., Pisgah and Wildcat Mountain is a rustic trail that takes you through the secluded mountain-like scenery. A perilous stream crossing and several small climbs make this trail delightful for the seasoned hiker. It is also accessible to families and there are plenty of nooks for a picnic in the woods. Bring a picnic basket, blanket, and fishing pole and lounge around creekside for the whole afternoon. If you came to Wisconsin Dells as a young child you probably remember walking on a boardwalk deep into a narrow moss and fern covered canyon. You might be trying to find these hikes now as an adult but don't remember that you experienced these as part of a boat tour. Witch's Gulch and Coldwater Canyon are attractions of the Dells Boat Tour Company. They are on privately held land, and to reach these hikes you will need to purchase tickets to the Upper Dells Boat Tour or Ghost Boat Tour.